Detailing the physical features, habits, territorial reach and other identifying qualities of the Square-Legged Camel Cricket. Thanks to its incredibly long spindly legs, the non-biting Square-Legged Camel Cricket can easily be mistaken for a spider. Square-legged Cricket Camels have normal-sized bodies but extraordinarily long legs. The shape of the legs, especially visible at the joints, is squared, not round like one might expect. These edges have small ridges or teeth that help accentuate the corners. 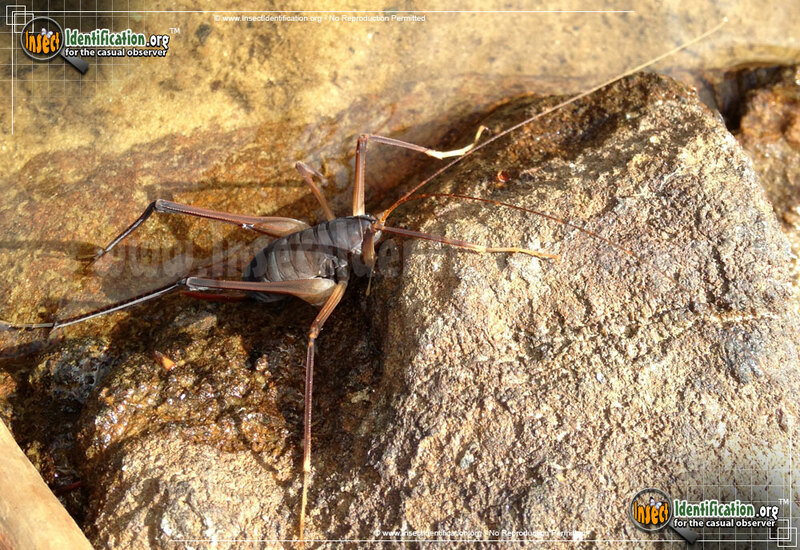 When they walk, they resemble spiders, but it can also hop because it is a cricket. Square-legged Cricket Camels do not bite, nor do they sting. Females have a curved, spine-like ovipositor that is used to bury eggs. It is sometimes mistaken for a thick stinger, but it is harmless. This species is a West Coast native that can be found near water or further inland. Its varied diet of insects, detritus, vegetation, fungi, and even feces make it easy to find a meal. Unfortunately, Square-legged Cricket Camels can ingest a nematode from deer mouse feces and spread it to healthy deer mice if eaten by one. These tiny worms affect the mouse's gut, making it sick. The nematodes are not a threat to humans, but their impact on mice can disrupt a food web that relies on healthy deer mice in order to flourish.